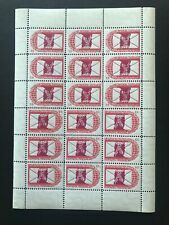 TETE-BECHE SHEET, MNH OG, VERY LOW QUANTITY ISSUED ! Perfect condition. IN PAIRS ! RUSSIA. UKRAINE. 1918. 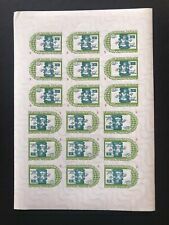 National Republic, UNR, Narbut issue, MNH OG ! Full set, with original gum. UKRAINE. 1935. UNR. Exile issue. Volodymyr The Great. MNH OG. Rare issue. Only 10,000 printed ! UKRAINE National Council in EXILE 1950's ISSUE ! MNH OG ! WMK, FULL SET ! Perfect condition. With nice margins. MNH OG, SECOND TYPE, WITH DATE. VERY NICE AND RARE SHEET ! RUSSIA. UKRAINE. 1918. 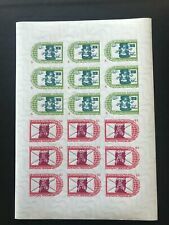 National Republic, UNR, Petliura issue, MNH OG ! IMPERFORATED SHEET, MNH OG, VERY LOW QUANTITY ISSUED ! Local for Belgium, Poland and Ukraine. Stamp with the original adhesive stickers without a trace. Perfect condition. Full sets with margins! RUSSIA. 1945. 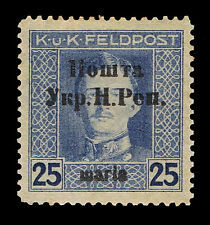 CARPATHO-UKRAINE 1st SOVIET ISSUE ! MNH OG ! CV 140 EUR ! MNH OG, RARE TO FIND IN SUCH CONDITION. FIRST SOVIET ISSUE. GUM WRINKLES GRADE AS HINGED. He told us that he sent his item to another Expertizing Service and received a 'Clean, Genuine' Certificate. REFERENCE WESTERN UKRAINE SCOTT #53. Very Simply. OF COURSE THIS IS SOLD ON AN AS-IS BASIS.